With this package Magento offers a powerful tool for the administration and presentation of your products. 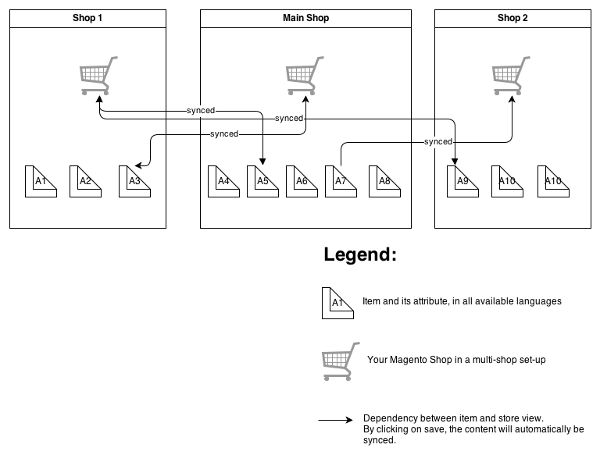 However, there is one serious limitation: multilingual product content must be managed several times as Magento can synchronise item attributes only from the default-value. The administration effort for multilingual product descriptions therefore increases massively (see the case study below). The recently published Magento Store & Config Sync by customweb Ltd. provides an ideal solution for this issue and serves as an excellent upgrade to your Magento System. You want to use different designs for the presentation of the shop. Each market requires different storeViews. However, the product descriptions should be used spread over various storeViews multiple times. You need to manage the different languages for each market. However, some of the content should be shared between the different store views. For the processing of payments in the USA/UK you are using the payment gateway of BarclayCard and the corresponding BarclayCard Magento Module. In Switzerland and in Germany you are processing all credit card payments with the PostFinance Magento Module. Until now you always had to edit and adjust product descriptions in Magento individually for each storeView. With a large assortment of goods this can quickly become highly time-consuming. When changing something in the German product description of the Swiss website, you have to add this manually in all other storeViews. For this case the Magento Product & Config Sync Extension is the ideal solution. This extension not only allows you to define for each product attribute with which StoreView respectively, which website the content should be synchronised. Changes will be carried out directly and product descriptions must be managed only once. The synchronisation works for the content of product descriptions as well as for all configuration variables; each on the level of the website or on that of the storeView. Websites: are the “parents” of the storeView. A website consists of several stores among which data can be exchanged. Store & StoreView: are the “children” of the website and serve as the configuration of the actual products as well as the presentation in different templates.